Space is full of mysteries, but one in particular has been weighing on our minds lately: How's the food up there? We're taking a look at how space meals get made, the best astronaut food hacks, and the experiment that showed just where the best french fries in the galaxy would really be found. 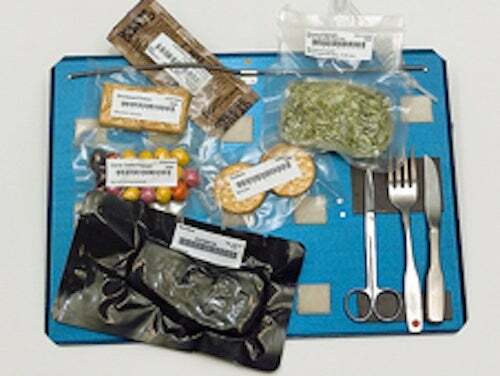 Over the years, the Space Food Systems Laboratory at Johnson Space Center in Houston — the group responsible for making sure astronauts stay fed in space — has arrived at a list of 200 core foods, each neatly stored in its own little pouch which can serve as a rehydration chamber if necessary or even be popped into the space station's food warmer for a heat and serve meal. Those 200 core items — which include everything from a rehydrated chicken-pineapple salad to a thermostabilized mocha yogurt — make up the backbone of the astronaut diet, though some of them are more appreciated parts of it than others. The freeze-dried shrimp cocktail is a particularly popular choice, a preference lab manager Vickie Kloeris told Gizmodo/io9 that she attributes to the cocktail's secret ingredient: horseradish, which gives the dish a bit of a spicy kick sorely lacking in much of the space fare. But, just like some items remain around through the years, there are also a few foods that get cut. 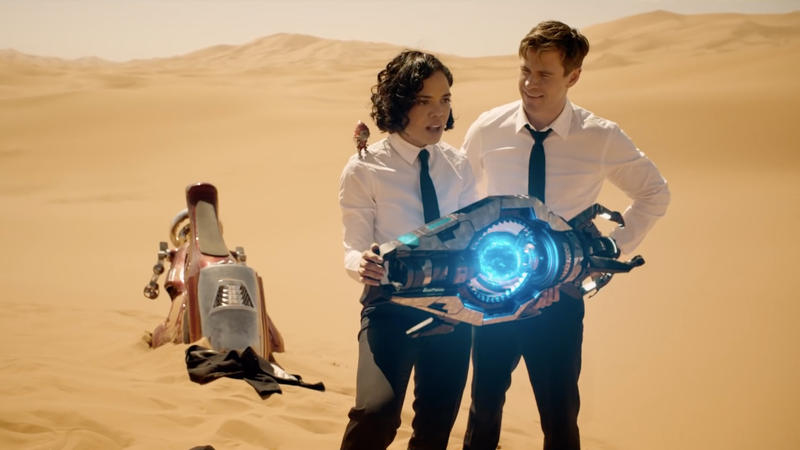 Graham crackers, for instance, were axed from the manifest after crew members complained about all the crumbs drifting around, a problem that also led them to favour tortillas over sliced bread. Besides the core items, each astronaut gets a bonus food container. And in there, there's also always a few off the shelf-items that make it into space (at the astronauts' request and the Food Lab's discretion) things like Kool-Aid, packaged snack cakes, condiments, and instant coffee. Sometimes, though, astronauts will go even further off menu. It's not so surprising that — when you gather a group of engineers and research scientists, and trap them in a metal tube for months at a time high above the Earth's atmosphere — they might start figuring out ways to tinker with their environment. Astronauts, particularly those stationed for long stints on the International Space Station, have come up with a few food hacks to add a little unexpected zest to their meals. ISS-favourite Chris Hadfield did a far-too-short-lived web series while in space, "Chris' Kitchen", where he took a Julia Childs-esqe approach to preparation of some of the freeze-dried, vacuum-packed options available, ranging from simply showing how he rehydrated a packet of dried spinach to a much more ambitious attempt at turning a premade steak, some tortillas, and hot sauce into a passable burrito. The undisputed champion of space food hacking, however, is without a doubt another ISS crew member: Sandra Magnus, the flight engineer for Expedition 18. While aboard the ISS, Magnus undertook a number of cooking experiments, aided by cutting boards and bowls that she anchored down with copious amounts of duct tape. 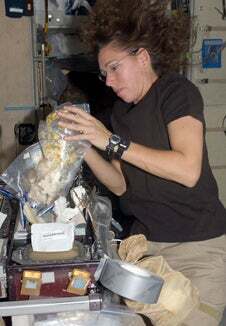 Perhaps the most impressive, though, was her repurposing of the ISS food warmer to make roasted garlic and onions, an operation she achieved by using foil packets that had previously held heat and serve meals and running the vegetables through the food warmer again and again for hours at a time. But, not everyday can feature so elaborate a spread: the onions alone took Magnus almost three hours to cook in the food warmer and astronauts' days are already packed. So what's the hungry, but time-strapped, astronaut to do when tired of eating their meals straight from the foil? The answer is best served wrapped up in a tortilla. In her space log, Magnus wrote a little about the important place the tortilla held in astronaut meals, especially in creating her favourite: the space cheese quesadilla. You can do so much with a tortilla; it becomes the vehicle with which to eat almost anything. I cannot think of anything that cannot be put on a tortilla, or has not been put on a tortilla. Consequently, one of the main goals of any crew is to make sure that enough tortillas get on board (the only other high demand object is caffeine) . . . My favourite thing though, is to just heat the cheddar cheese spread, put it on the tortilla and add some salsa. You end up with a space cheese quesadilla. Of course, it's not just issues of taste and preparation that you have to think of when approaching the problem of cooking on space. The physics of cooking itself are altered by the conditions of space. Our cooking techniques are honed at Earth's gravity and, when we take those techniques to other gravities, the results can be surprising. Jean Hunter, a professor at Cornell who studies how food and cooking work in space, explained how even something as simple as making a hard-boiled egg becomes difficult without Earth's gravity to aid in the boiling process. "The problem with cooking in space is that there's no gravity," Hunter told io9. "If you wanted to boil an egg, for instance, the vapour and the liquid won't separate. Rather than the water boiling like on earth where the bubbles rise to the top and release steam, what you'd get is more like a can of soda flowing over. It would be very difficult to cook with it." If we're looking ahead, however, to not just cooking on the space station, but perhaps to cooking on other planets and moons someday, the issue of gravity becomes even more complex. Hunter is currently working on an in-progress experiment looking at how the gravities of the Moon and Mars might change the way cooking oil behaves, especially how it splatters (valuable information to anyone who has ever held a sauté pan). There's good reason to believe, though, that different gravities can alter not just cooking processes, but how the food responds to those processes as well. Consider, for instance, the humble french fry. Last year scientists in Greece's Aristotle University, working along with the European Space Agency, began to wonder just how this most earth-bound of dishes might respond to being cooked in the exotic gravities of space. So, using the ESA's centrifuge, some julienned potatoes, and a specially-manufactured deep frier, the researchers tested out how fries responded to being cooked in gravities up to nine times greater than Earth's own. What they found, as they explained in a journal article for Food Research International, was that the stronger the gravity, the crispier the skin of the fry and the quicker it cooked — up to a point. The sweet spot for a genuinely crispy fry was at about 3 times Earth's gravity (interestingly, a situation most closely reflected in our solar system on Jupiter). Increasing gravity wasn't completely good for the fries, however. At gravities stronger than the coveted 3 times slot, the fry began to lose structural integrity. 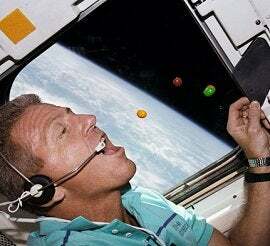 We have a pretty good handle on how to feed astronauts on the short space trips taken so far. But what about when we're talking about going further into space — to Mars, perhaps, or Europa, or even beyond? NASA's Food Lab has already begun grappling with the problem of how it would feed astronauts headed out to Mars, a problem that is as much one of time as it is of food. 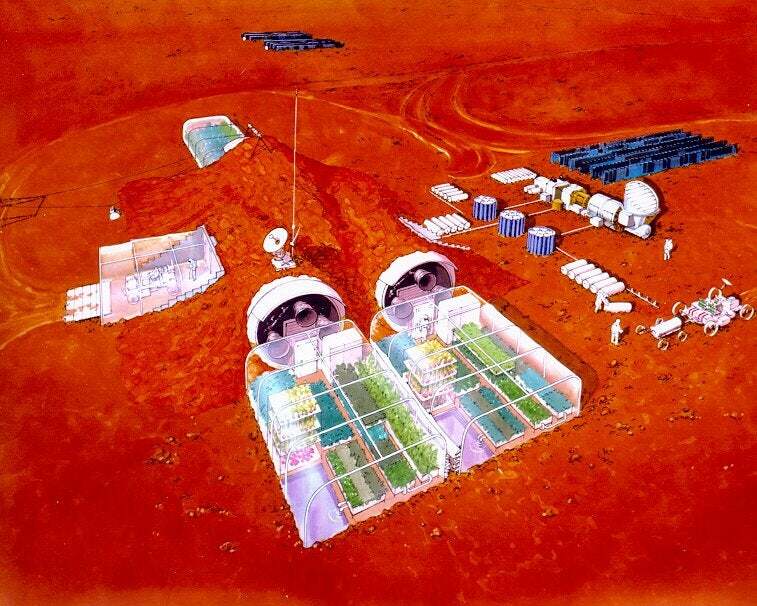 "A mission to Mars is going to require foods with a very, very long shelf life, probably in the neighbourhood of five years," Kloeris told io9. "We're doing research into how we can extend the shelf lives. Our current foods have 2-3 years of shelf life. We're also looking at, over time, how much nutrition do you lose out of the foods and which nutrients are the most at risk in a 5-year food supply." It isn't just a matter of the food not spoiling, though, there are also concerns about the amount of weight and storage space that would be occupied by such a significant amount of food. Longer shelf-lives and packaging innovations are one way to slice the problem, but there's also another possible solution, one that combines portability, renewability, and even freshness: Perhaps astronauts could grow their own food. An experiment began just this month on the ISS to test just how that process might start to unfold. In a sealed chamber, the experiment known as Veggie, is starting off small with some Romaine lettuce. After seeing how the lettuce fares, researchers hope to expand to other fruits and vegetables. Of course, it's still a long way from salads grown in space. But, if successful, it could at least provide a welcome respite from the days of rehydrated scrambled eggs.